Low cuff, Tour de Cure cycling socks to be used as incentives. Blue socks are blue and white with the Tour de Cure, Stop Diabetes and American Diabetes Association logos. 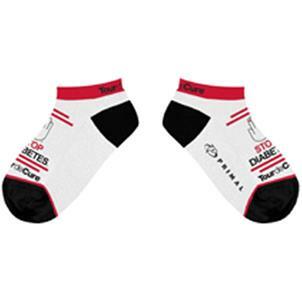 White socks have with black and red accents, and are imprinted with the Stop Diabetes logo and "Start a Chain Reaction" tagline. Yellow socks are yellow and grey with the Tour de Cure and Stop Diabetes logos.